Kind of a stunning cultural moment to attend the first-ever Hologram-only theater right on the tourist strip of Hollywood Boulevard. A block from the Egyptian Theatre, it’s a wholesome entertainment addition to the ‘hood. 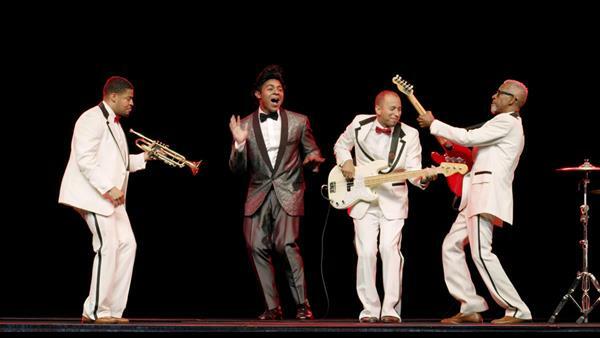 Last week, we attended a debut screening of a hologram-homage to a great r&b/early-rock artist, Jackie Wilson. Now, gosh. This strip of land, aka the Hollywood Walk of Fame, is more Michael Jackson territory — not that there is a darned thing in the world wrong with that. But who broke ground for Jackson? 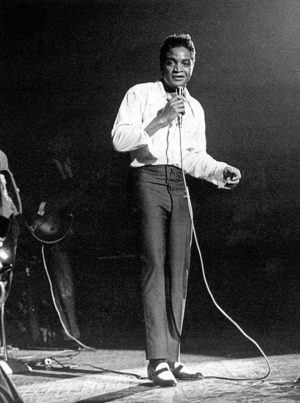 The flamboyant, falsetto-singing, suave-dancing Jackie Wilson. It’s such an unusual tribute to a pioneering r&b man. But hey, this theater launched with Billie Holiday Alive! six months ago, so someone over there has some taste going on. The show was super fun, comfy seats, good sound system, a/c working; everyone listened, there was no cellphoning and the whole thing garnered a lot of respect for Wilson. The content skewed toward the lurid, stressing Wilson’s financial and female problems (the two “f”s) but who on Hollywood Boulevard doesn’t have those? Everyone can relate. Founder and CEO Alki David was a generous host, proffering CBD Oil-infused chocolates and shakes courtesy of Swissx at the launch party. Sucking on that choco-shake while watching Jackie Wilson shake rattle and roll, back from the grave, was my idea of a really good time. For those who have graduated from milkshakes, Musso’s awaits right across the street for the martini-deprived.